Most of the globe had temperatures warmer than the historical average in September, with new warm records in southern Africa, southeast Asia, and off the Atlantic coast of South America. There were no cold records. Graphic courtesy of NOAA. 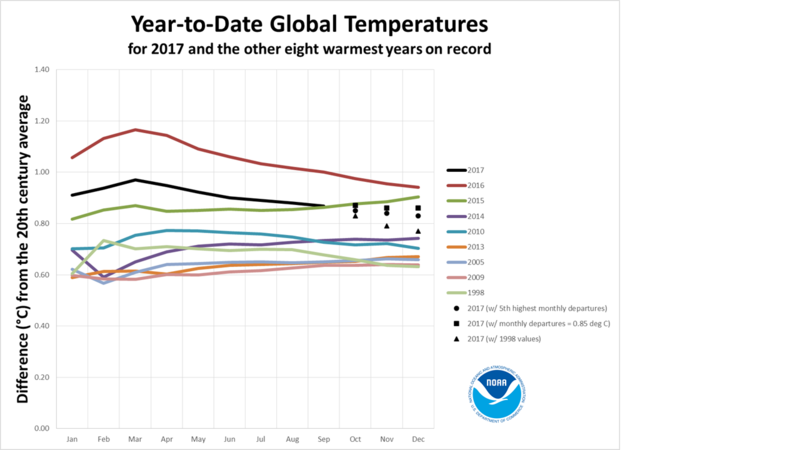 September 2017 was only lukewarm compared to recent Septembers; yet, 2017 is still second warmest year-to-date in 138 years of temperature records. Recent catastrophic events have heightened awareness of man’s relationship to nature, and perhaps the discussion needs to be broadened further. Public attention has been focused on global warming — more properly referred to as climate change — but the more general subject is man’s interaction with his environment. Often, this interaction has been beneficial to humanity: paths are cleared to allow easy travel; boats are built for access to sea and lake; warm enclosures are created for survival in cold weather; inconvenient animals are exterminated or confined. Sometimes, the interaction is barely noticed: the use of electromagnetic waves that makes wireless communication possible; the lift provided by the atmosphere that allows airplanes to fly. Sometimes the results are mixed: nuclear power plants supply electricity, but the spent fuel rods must be disposed of and, worse, meltdowns are possible; airplanes allow rapid travel, but they burn a lot of fossil fuels and create contrails; comfortable or useful buildings are constructed in places that are subject to occasional catastrophic weather or other events: earthquakes, hurricanes, tornadoes, fires, volcanoes. If you live in Mexico City, you know about earthquakes; if you live in San Juan, you know about hurricanes; and if you live in Napa Valley, you know about fires. Many parts of the earth are considered either uninhabitable — or habitable only with extreme effort: the top of Mount Everest; the entire continent of Antarctica; most of Greenland. This judgment is made because of average conditions in these places. But it is becoming part of the public consciousness that some places are dangerous by virtue of their being subject to occasional catastrophic events. Perhaps some areas of the earth should be considered uninhabitable because of their vulnerability to extreme weather or other natural factors. Wildfires can be catastrophic when they invade inhabited areas. Photo courtesy of NOAA. The Columbus Day firestorm in northern California is a case in point. The environment conspired to produce rapidly raging fires that could not be contained, and in some cases could not be escaped. At least 41 people died in the recent blazes. Though the connection is still not conclusively proven, there is considerable evidence that global warming is producing more persistent weather — longer droughts, slower moving storms, and longer heat waves. It is possible for average temperatures to remain essentially constant, but the daily lives of humans to be progressively more interrupted as the distribution of temperature and precipitation changes. As for the California fires, the connection to climate change is this: Four years of drought were followed by record rains. Combustible plant material first dried out and became kindling; then rains induced new growth. Subsequent return to drought left everything dry as the proverbial bone and ready to burn. All it took was a spark and high winds to create the firestorm. As high pressure built to the north, winds gusted to hurricane force in the Columbus Day firestorm north of San Francisco. September 2017 was the fourth warmest September since 1880. Broken down by hemisphere and land/sea, all the categories were in the top ten, all but one in the top five. Year-to-date is still second only to 2016, but by the end of the year, 2017 will probably finish third behind 2015. However, with the growing attention to the possibility that the atmosphere may already have passed a significant inflection point beyond which more frequent catastrophic events are inevitable, the question becomes not whether the atmosphere will respond to man-made changes in greenhouse gases, but how. Despite a lack of support from the President of the United States, the Paris accord is alive and well, and many countries are reducing, or to be more accurate, planning to reduce, greenhouse gas emissions. So far, measurements of atmospheric carbon dioxide continue to climb, and evidence of whether emission-reduction efforts will succeed is, shall we say, up in the air. Prior to the US withdrawal (which technically will not become final for three years), only two of the world’s 197 countries had not ratified the Climate Agreement: Nicaragua and Syria. Nicaragua’s president announced his country will join, so there will still be 195, or 99% of the world’s nations included, even if the US does withdraw. And as we noted in Climate Change Checkup last month, many US states and corporations are taking significant initiatives to reduce carbon emissions. Possibly this summer’s fire/flood/hurricane disasters will spur faster action to confront climate change on public, private, and corporate levels. I hope you’re right–it was a terrible year for natural disasters. It should inspire action from everyone.